Nancy Gibbs, Time magazine’s newly-named managing editor — and the first woman to hold that position — takes the reins at an uncertain time, with Time Warner preparing to spin off its publishing division later this year. In replacing Rick Stengel, Gibbs now edits the only major newsweekly—from a group that includes Time, Newsweek and U.S. News & World Report—that still publishes a print edition. But she will oversee a publication that has experienced significant long-term declines in circulation and advertising pages. Time’s overall print circulation has dropped 21% over the span of 10 years from 4.1 million copies per week on average in 2003 to about 3.3 million in 2013, according to the Alliance for Audited Media. In 2007, Time deliberately reduced its rate base from 4.1 million copies to 3.4 million. And since then, the magazine has dropped another 4% of its total circulation, including nearly half of its single-copy newsstand circulation. 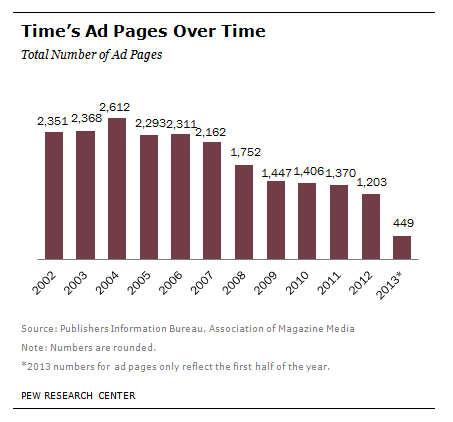 From 2002 through 2012, Time’s ad pages declined 49%, according to data from the Publishers Information Bureau. This downward trend continued in 2013. In the first half of 2013, Time lost 17% of its ad pages, compared to the same period in 2012, marking the seventh year in a row that Time’s ad pages dropped. Ad pages are considered a more reliable indicator of the financial health of a magazine than ad dollars because the dollar figures are based on rate card pricing that often does not reflect what an advertiser really pays. On the digital front, Time’s results are mixed. In the first half of 2013, Time added about 42,000 digital replica subscriptions and nearly 2,500 digital replica single copies, bringing its total circulation (print and digital) up 0.7%, compared to the year before. 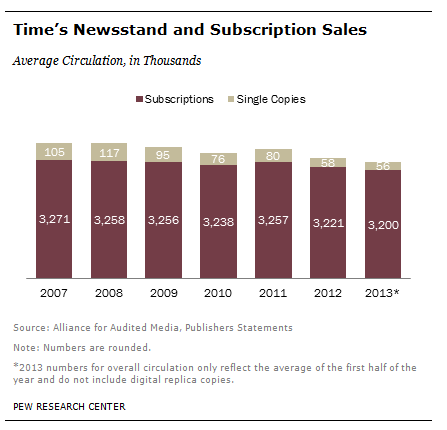 (This year marks the first time the Alliance for Audited Media has broken out digital circulation data for Time.) Overall, Time’s online readership has stalled, according to Nielsen Netview data. After jumping from about 5 million unique monthly visitors in 2010 to 7.7 million in 2011, that number remained the same in 2012. However, Time maintains the largest website audience by far in relation to its news magazine rivals. The last few years have brought changes and cost-cutting to Time Inc. In December 2011, Time Inc. replaced CEO Jack Griffin and hired Laura Lang, then head of digital ad firm Digitas, to run its magazine operation. In March 2013, Time Warner announced a decision to spin off the Time Inc. publishing group and a few months later, brought in former Time Inc. CFO Joseph Ripp to replace Lang. In January 2013, Time magazine cut six positions as part of broader wave of layoffs (500 jobs) at Time Inc., the publishing division that houses Time magazine. Those cuts were part of a mandate from Time Warner CEO Jeff Bewkes to shave $100 million from the publishing division’s annual costs.At the same time, Time announced it would publish 48 issues in 2013, three fewer than in 2012, to bring costs in line with lower revenues.